March 24, Singapore-based crypto exchange DragonEx has popped up on the hacked victim list, reporting losses arising from the recent attacks. The exchange has retrieved part of the assets and is trying to get the rest back. The DragonEx is a top-50 cryptocurrency by trading volume, handing around $187 million in the last 24 hours, according to CoinMarketCap. This exchange mainly focusing on Chinese users. On March 24, the exchange post an announcement through its official Telegram channel to inform the hack attack and promised that they will take responsibility for the loss caused to their users. However, the exchange did not elaborate on the exact amount of loss. 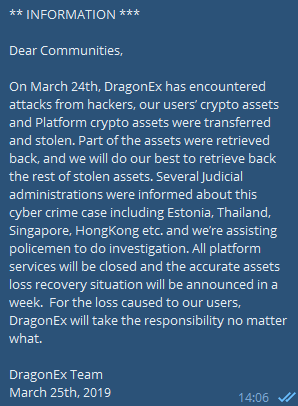 This morning, DragonEx announced on its official website that they have detected several addresses where the stolen assets have been transferred. The DragonEx Team is trying their best to retrieve the losses, and calling on all the related exchanges and parties to freeze these accounts in order to stop the flow of funds. These coins were transferred to leading exchanges such as Binance, Bittrex, and Huobi. As of press time, addresses listed above has been frozen on Huobi and Gate.io. Chinese cybersecurity firm SlowMist indicated that DragonEx encountered massive USDT false top-up attacks. According to the “hacker addresses” listed by DragonEx, SlowMist speculated that over 20 kinds of cryptocurrencies have been stolen, including BTC, ETH, EOS, XRP, ETC, and USDT. SlowMist also concluded that this attack lasts for at least one day, and hackers have managed to acquire much of authorizations of the exchange. Notably, it was reported that another Singapore-based crypto exchange BiKi has also encountered hijack attacks from hackers in this morning. The surge in cryptocurrency exchange hacking activities causes panic and anxiety among crypto investors, especially in a bear market. Another hack shows us KYC and leaving your keys in 3rd parties is dangerous to your money and identities. How many hacks have to be done until you understand not to leave your money on exchanges ? That monero address is not even an address, professionals at work.